This is a great little article that will show you the consumer how to buy gold. Many people want to protect their financial future by investing. One of the more popular ways to do that is by purchasing gold. While the actual value of gold may go up and down, it maintains a much more stable value than a lot of other investments, like stocks and bonds. There will always be a market for gold. There are different ways to purchase gold, including actual gold bars and coins, as well as gold stock, and gold jewelry. All the forms of gold investments have their advantages and disadvantages, so it is important to determine which one is best for your personal investment plan. Before buying gold, you need to research the dealer to make sure they are reputable. Then, you need to determine a safe location for storing the gold. It is best not to keep it in your home. A safe deposit box in a bank is typically a good choice. Many experts recommend putting at least 10% of your overall financial portfolio in gold, but not all of it. When most people think of gold bars, they picture large brick-sized gold bars. While these bricks, which are kilo bars of gold, are traded, they are not available to the general public. This form of gold is reserved for governments. Gold bars also are found in 10-ounce and 1-ounce units. It is the 1-ounce unit that is the most prevalent form of gold bars available for purchase by the general public for investments. Buying gold is not an impulse buy. You need to determine how much you can afford. Before you purchase the gold bars, research the gold prices, and as with any investment, buy when the prices are low. The price will also vary between different dealers, as well. So shop around and get the best value for your dollar. Gold coins are another popular form of investing. Gold coins are easy to buy and sell, they take up relatively little physical space, and come in a wide variety of styles. Gold coins can be purchased directly from the US Mint as well as dealers and individuals. If someone is lucky enough, they may even find or inherit antique gold coins. The American Eagle Gold Bullion Coin is a 22 karat coin that is produced only with gold mined in the United States. Unlike other coins, they are minted in different weights, including 1 ounce, as well as 1/2, 1/4, and 1/10 ounce. This allows the coins to be affordable for a variety of budgets. There are even proof sets, which contain one of each size coin. The face value, not the gold value, of the coins are $50, $25, $10, and $5. When dealing in antique coins, not only does the value of the gold itself influence the price. The age and condition of the coins will make a difference in the final value of the coin, as with any older coins. The more rare a coin is, the more valuable it is. Coin collectors and antique dealers are good resources to determine the actual value of the coins. Like all stocks, gold stocks can be bought and sold. It is best to buy when the price is low and sell when the price is high to maximize your profit. Three basic forms of gold stock are stock commodities, gold mining stocks, and gold futures. You can also buy exchange traded funds, which are gold mutual funds. This is a way of trading gold bars through the market. Each have their strengths and weaknesses, and depending on your investment style and goals, which is best for you. It takes a lot of patience and knowledge about how the market works to make the best purchase at the right time. Going through an investment broker can help reduce your risks. 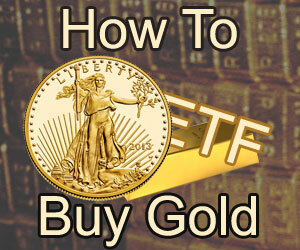 Many investors prefer the gold trust ETF for a better return on the investment. The popularity of gold jewelry will always make it a valuable commodity. The purity of the gold will determine its overall value, in addition to the aesthetic value of the piece or who the designer is. The jewelry will range from 10K up to 24K. The karat system is based on 24 units of metal in the piece. In the United States, 24K is pure gold, while something that is 10K is 10 parts gold with the balance of the 24 parts is made up of a less precious metal. Something that is 12K is 50% gold. Keeping these numbers in mind when pricing a piece will help you determine if the asking price is fair. If you are new to purchasing gold jewelry, it is a good idea to find a trusted jeweler who will help appraise the value of the item you are interested in purchasing. If you are purchasing from a reputable dealer, you may not need an independent appraisal. A good source for purchasing gold jewelry would be an estate sale, as the jewelry is often sold in lots. You may get some cheap pieces, but you may also find one long forgotten watch or necklace that could be worth a great deal. Broken jewelry is also a good investment, and the metal can be made into new pieces, or just made into ingots. As with any financial venture, doing your research is the most important step. The more knowledge you have, the better choices you will be able to make. Any investment has some inherent risk, but gold tends to be a fairly safe investment. However, it is important to chose the option that fits the time frame and return you are expecting. Are you investing long term? Then stocks may be the better way to go. Are you looking for something with a quick turnover? Then you may want to look at coins and jewelry that are easier to sell.